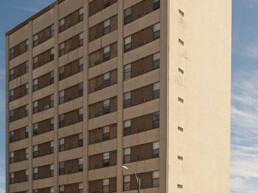 Landmark Plaza Apartments, located in downtown Topeka, Kansas provides affordable housing for the elderly and disabled. Its central location in Topeka provides access within walking distance to shopping, banks, restaurants and entertainment centers. We encourage you to visit the Topeka, Kansas website to see all that is available nearby. Parking is provided for those residents who have their own vehicles, but the city bus, which runs hourly, is available at a minimum cost, to those who prefer that mode of transportation. Convenience units as well as one bedroom units are available and laundry facilities and trash chutes are located on each floor. Our large lobby provides ample space for our residents to watch TV, listen to the radio, or to just visit. A library is located on the second floor and our basement has an exercise room with treadmills, bikes and weights. Our large community kitchen area provides ample space for holiday gatherings for our residents or may be reserved for private parties. Our friendly, resident community provides bingo, card games, holiday gatherings and other activities. Residents may choose to be active in any or all of the activities depending on their interests. We encourage you to visit Landmark Plaza Apartments and meet our outstanding staff and tour our property.